45 minutes to the east of the Sandestin Resort is one of our all-time favorite restaurants: Captain Anderson’s. It, like Lambert’s, is one of those restaurants that it is worth taking a drive to visit. 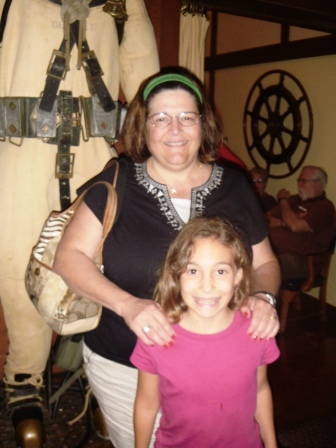 Captain Anderson’s is a seafood restaurant and has been owned by the Patronis family for over 40 years. They have a large dining room, divided into several smaller rooms. The restaurant is right beside a marina, and there are fishing boats moored to the pier behind the big picture windows at the end of the restaurant. 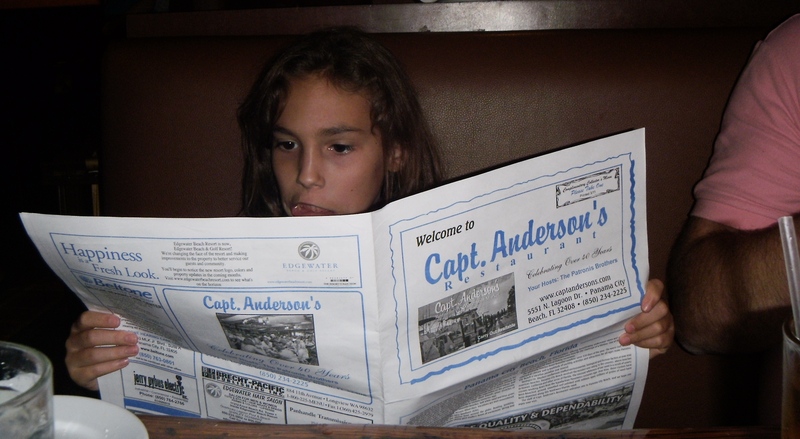 At Captain Anderson’s, you will receive fresh, well-made sea food and excellent service. We have never had a bad meal or a bad experience there. Other people know about Captain Anderson’s also. This means that if you go at peak hours on Friday and Saturday, you can expect a wait, and of course, the bigger the party, the longer the wait you will have. However, we have found that the restaurant has a system that ferries parties in and out expeditiously, all without your ever feeling rushed during your meal. In addition, we try to arrive somewhere between 4 and 5 in the afternoon, preferably on Monday through Thursday. Each time we do that, we are able to get a seat right away. For those who do have a wait, however, the waiting room has interesting artifacts scattered throughout to keep you entertained. By a family vote of 2 to 1, and the camera’s vote of 1 -1, (I had a new camera I was trying to use and was having some difficulties) my picture-taking of the waiting room was limited, but here the pictures I was able to take. 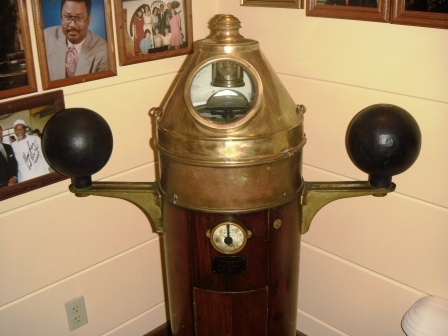 This gizmo is in the corner of a hallway. I have no earthly idea what it does (Mark did, but I can’t remember what he said), but it certainly looks interesting! In addition to lots of things to look at while you wait, Captain Anderson’s now has a newspaper-like menu, with a description of its history and Panama City’s history in it. We picked one up, and Kayla kept reading it even when we reached our table. It made the rounds between all three of us during the short wait for our food, which not only included the appetizer of fried cheese we ordered, and our entrees, but salad (or in Mark’s case, soup) and a basket full of fresh bread and various crackers. 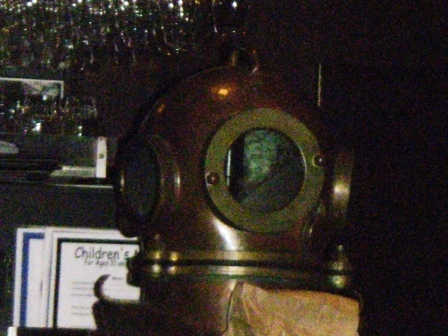 On the bar across from our table, there was a brass diving helmet, something you don’t see everyday! We don’t get dessert every time we go out, but at Captain Anderson’s it is just too hard to say no. (Although I would have made Kayla get something else had I known what she was going to use the hurricane glass for later!) FN. 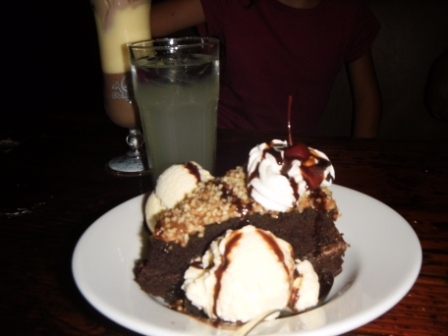 I got the wonderful brownie concoction you saw at the beginning of this post, Kayla went with a hurricane glass full of pudding, and Mark ate his favorite, Key Lime pie. As we were rolling ourselves out of the restaurant, Mark offered to take Kayla and my picture besides one of the two or three large, old-fashioned diving suits that decorate the restaurant. 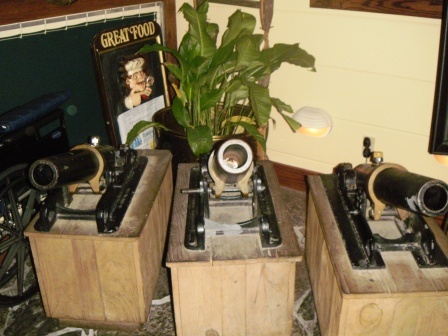 (Panama City is home to the Navy’s diving school, which is why many of the decorations at Captain Anderson’s have a diving motif). Oh, and they also have a gift shop along the side that is fun to wander through; we didn’t get there this trip, but we have on others. At least one item in the gift shop is a cookbook with some of the Patronis’ family’s favorite recipes in it. I bought it years ago. I haven’t used it, but I bought it! FN. 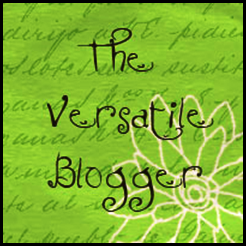 Just when I thought I could retire the list….